We all know in the industry that time is money, but how much is your time really worth? How much is your employees’ time worth, or the value of your entire fleet’s services each day? How ever you decide to quantify the cost of wasted minutes and hours, it’s clear that to be successful, waste must be minimized. This is where the VMAC G30 air compressor comes in. This rotary screw gas driven air compressor is your equipment MVP for getting jobs done faster. Get on-demand air in the time it takes to walk from your truck to your tool; no more waiting around for the air pressure to build. And with 30 CFM at 100% duty cycle, you can get through your jobs in less time and with no interruptions. 50% more powerful – VMAC’s patented rotary screw air compressor has been engineered to produce full air power, on demand at 100% duty cycle. Typical gas driven reciprocating air compressors produce approximately 20 CFM and can only operate at 50% duty cycle. With a 100% duty cycle, the VMAC G30 will be able to handle the entire job, without interruption, for maximum efficiency. See the full VMAC G30 gas driven air compressor, plus specs and components, including the cold climate kit for temperatures hitting -25­°F (-32°C). 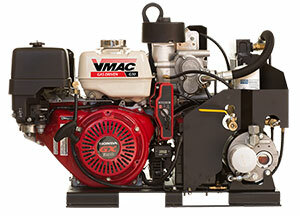 Watch VMAC’s G30 demo video to see this powerful and compact compressor in action.